As the Boston Marathon heads for the coast, two members of Skegness Coasters running club will be facing a challenge of their own - to raise money to help a baby boy who may only live until he is two years old. Rebecca Porter and Elly Rutherford are running their longest distance of 10 miles on Sunday, starting at 10am from Chapel Point in Chapel St Leonards and finishing at The Welcome in Skegness around noon - the same time as the leaders of the Boston Marathon are expected to arrive in the resort. 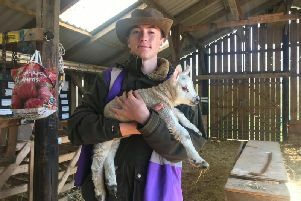 The friends’ challenge - 10 Miles for Harrison - has already raised £305 of the £350 target set on their JustGiving page. Harrison was diagonised with Spinal Muscular Atrophy type one at 13 months old. The life expectancy of a child with this condition is only two years. Rebecca said: “Everyone is hoping Harrison will live a lot longer. However, in that time he will need a lot of specialised equipment, which sadly costs a lot of money. To support them visit the JustGiving page here.